This month the challenge is so about me!! It’s a hoot to have “Change” be the topic the month we’re making all the plans to retire and move from the prairie of Nebraska to the coast of Oregon. So far this month, we’ve had a gigantic garage sale and our house sold quickly. Looking ahead is just the endless sorting and packing … and packing and sorting … oh, and praying it all fits on the truck! Then driving for 3 days, sorting and unpacking… At 55 this doesn’t thrill like it used to! My sewing room is kind-of packed so I’m working in a different medium this month – paper collage. I remember doing this when I was in school oh so many years ago and then again when my kids were in school. The new copiers are great tools for this. I laid my pieces down and scanned it and Voila! A jpg! Okay – laid it down several times, fiddled and cropped and then Voila! I chose a picture of the prairie and the picture of the coast taken from my condo living room window. 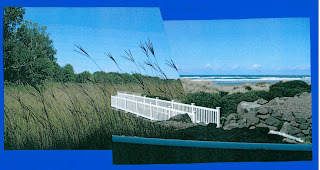 How convenient that a bridge to the beach was able to reach into the prairie and lead me into my new life, making the transition easy for me! The transition isn’t seamless – the edges don’t line up. But there is sky in both – the vegetation changes but is still wheat and grasses. The bridge goes both ways – so I’m able to cross back and forth in my mind. It’s hard leaving “home” even though we’ve been dreaming of this for years. Good friends, family, my favorite job, quilting groups, water aerobics friends, even my personal rut(!) are all hard to leave. Heading off into the unknown isn’t what it used to be. We have cheap or free minutes of long distance; we have email and blogs with pictures; we have frequent flyer miles to spend on trips and visits … it’s not like covered wagons following the Oregon Trail … but it can feel like it. But I can also admit – just between you and me [giggle] it’s also exciting . I have a granddaughter to get to know and babysit and teach all those grandmother things to!! The importance of watching clouds, making cookies, playing with fabric and giggling! I’ll be retired and I’ve got enough quilting projects in mind to last me until my 90s and beyond. We’ve visited/driven through Newport for the last 9 years so – a slightly familiar area to explore further – an indoor pool in the complex for water workouts for my knees, 8 miles of beach to walk any time, any tide! There’s a great quilt shop in town with a guild ready for me to join and I hope a small group of scrappy quilters – ‘scrappy’ in more ways than one. I wonder if I need to take references from my quilt group here! LOL! Change – here it comes, ready or not!!! changing life. I really like what you did with the pictures. back to PEI, Canada. I can understand all you have to do. journey, which has been wonderful. Mom's 90th was celebrated in style! Want a nice house in Lincoln Nebraska?